No, it's not Mega Man. Capcom hates that dude. Asura's Wrath, a new Capcom property that blends stylized, over-the-top fisticuffs with equally stylized allusions to Eastern mythology, hits shelves next week, but apparently the company just couldn't wait to drop hints about the title's upcoming downloadable content. 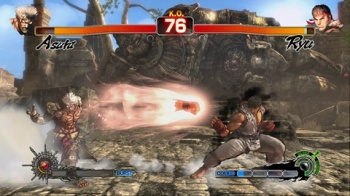 And by "hints," I mean "a screenshot depicting the protagonist squaring off against Street Fighter icon Ryu." The image in question can be seen embedded at top-right, and as you'll likely notice, the company has put a hilariously meticulous amount of work into creating a special stage that appears to have been ripped straight out of Street Fighter IV. Those life bars? Ryu's super meter? The timer? None of that is present in Asura's Wrath normally, but this DLC is all about loving homage. Speaking of which, I just noticed that statue in the background. Wanna bet that thing is a nod to the stone Buddha in the classic Thailand stage from Street Fighter II? Anyway, the bad news is that we have no real idea when this DLC is going to be released. Capcom dropped that screenshot, then sorta walked away, whistling innocently and hoping we fans would be worked into a lather by the presence of the world's most famous fighting game character. Hopefully the company will offer further info sooner, rather than later.